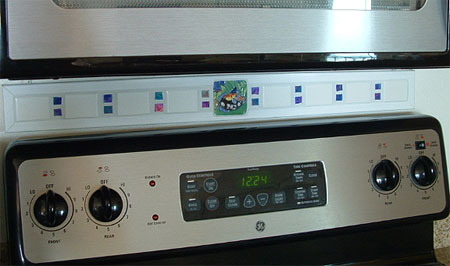 Robin says,"These pictures also include the magnet that you sent me in which I took the magnet off and used the tile over the stove.The little 4" tile was a great starting point for a wonderful back splash. My daughter walked in the beach condo today and said "Mom, you have vision. It's beautiful!". Needless to say I was quite pleased. We share Robin's pride in a job well done! Adding a kitchen tile mural or kitchen tile mosaic brings new and vibrant life to a once-bland space and lets the head cook of the household make a personal statement about their joy in cooking. All across America, kitchens are starting to be where the real action is, and they deserve to be both beautiful and functional! 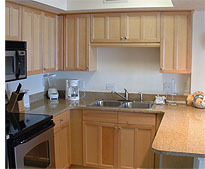 Take a look at your own kitchen today and ask yourself if it looks like a place people would enjoy spending time. 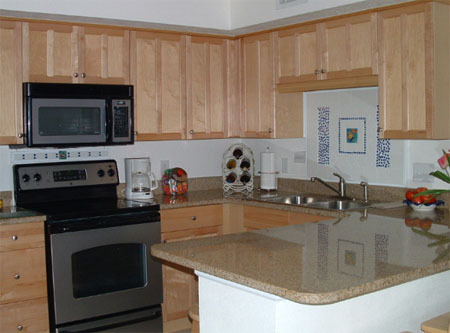 Tile mosaics and murals are an affordable way to go from drab to dynamic in your kitchen. 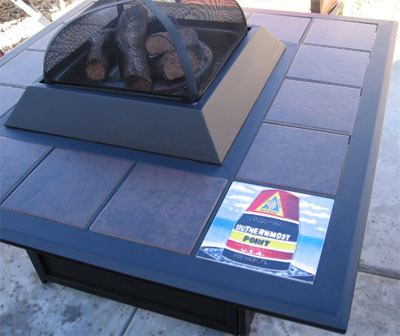 A Firepit With Fabulous Ceramic Tile Flair! In parts of the country where the weather is fine year-round, or where summer days are just too good to waste indoors, many families enjoy an outdoor living or cooking space. Firepits create a focal point for relaxing with family and friends on the patio or in the garden, relishing a great meal, or sipping a hot drink as the stars come out overhead. Valued customer, Cynda, personalized her firepit by adding a ceramic tile to it that brings back happy memories of her trips to Key West. Look at what a wonderful, creative job she did! Cynda says,"We bought this fire pit with 8x8 brown tiles. I wanted to add my personal touch so thought adding tile pieces from places we have vacationed or visited would be a great conversation piece. I love my first tile. We travel to Key West often. Just looking at it brings back so many good and happy memories. My next purchase will be the Conch Shell Tile!! Thanks so much for the quick delivery, no shipping cost and a hand painted tile of very high quality. We Love It!!" It's a treat for us to see the remarkable things customers are doing with our ceramic tiles in their kitchens and outdoor living spaces. Because the kitchen is the place good food is prepared with love for your family, it deserves to be the liveliest place in the home. The essential ingredient of great cooking is creativity. You master the basics - how to cook rice properly, how to make a fresh salad, lump-free mashed potatoes, spaghetti sauce with zing. As you gain confidence, you begin to riff on basic recipes like an artistic jazz musician. You discover that fresh herbs turn a plain soup into a dish fit for a king and that pizza crust made from scratch may just be the best thing you've ever tasted in your life. Before you know it, you may be trying your hand at Greek dolmas, chow mein and enchilladas! The kitchen becomes your thinking place, your dreaming and creating place. It's only fitting that your surroundings should match the brightness of your ideas, and we love the way a few carefully chosen decorative tiles turn a blank space into your space. Have you used Cape Cod Treasure Chest's decorative ceramic tiles in your kitchen or another room in your home? We'd love to hear about it!